How to work "back loop crochet" and why to try it! Most crochet stitches, particularly if the pattern doesn't state otherwise, are worked through both loops, but there is the technique of working through one or the other to create different textures with the same stitches. 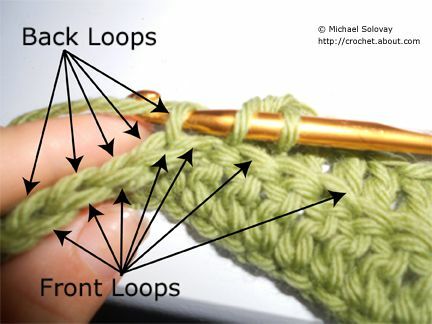 When worked through just the front loop, the technique is called Front Loop Only crochet and when worked in just the back loop, the technique is Back Loop Only crochet. Back Loop Only crochet generally has a ribbed appearance and is a stretchier fabric that the same stitch worked through both loops or through the front loop only. For example, back loop only single crochet would be slightly elongated and stretchier, with a ribbed appearance across the piece, than a fabric made in single crochet worked through both loops. Crochet patterns will indicate that the stitches should be worked in the back loop only by using one of the above indications. Following is additional information for understanding back loop only crochet along with some patterns for practicing this technique. Crochet in the Back Loops Only? What Does This Mean, Exactly? Let’s clear up what is meant by this mystifying set of instructions. When you crochet a stitch, you automatically create a set of loops at the top of the stitch. This happens whether you realize you're doing it or not. Many new crocheters don’t realize it, because it’s something that isn’t always clearly explained when you get started with crochet. If you crochet a row of stitches and then tilt the work so that you can look at the very top of it, you’ll see this set of loops. Usually, the “default” way of working is to crochet into both of these loops; you insert your crochet hook under both the front and back loop to work your stitches. If your pattern doesn’t specify which loops to work into, it’s a safe bet that you’ll probably work through both loops. But, you don’t have to do it that way. Back Loop Only vs. Front Loop Only: The loops on the upper edge, on the side of the work facing you, are the front loops. The other loops behind those are the back loops. When instructed to work into the "back loops only," you’ll want to insert your hook ONLY under the back loop, without the hook going under the front loop. Each stitch is formed as usual, EXCEPT that after you wrap the hook around the yarn to form the first part of the stitch, you only reach under the back loop, then complete the rest of my stitch. The front loops are unworked; they are visible if you look for the little ridges under each stitch. "Front" and "back" are relative, and they depend on the position from which you are viewing the work; the back of the work could possibly change at any time if you flip the work over to the other side. When you’re only working into back loops, it typically means that you will work into the back loops no matter which side of the work you are working from. You will always work through the loops furthest away from you as you work. Your pattern will usually give you specific guidance about whether to work through the back loops throughout the piece, or perhaps only in some specific parts of the project. With some of the basic crochet stitches, such as single crochet and half double crochet, working into the back loops only gives your crocheted fabric an interesting ridged appearance. Also, fabrics created in this way are delightfully stretchy in the vertical direction. To take best advantage of this stretch, you can crochet various projects in the horizontal direction, then flip them in the vertical direction when you actually use them. Hat Worked in Back Loop Single Crochet Stitch. Hat Worked in Back Loop Single Crochet Stitch. Photo © Amy Solovay. The team spirit hat is worked in straight horizontal rows of back loop single crochet stitch. To finish the hat, you join the top of the work to the bottom, and then close one side. Then you flip the piece so that the entire thing is vertical when you wear it. A Headband in Half Double Crochet Worked Through the Back Loops Only. A Headband in Half Double Crochet Worked Through the Back Loops Only. Photo © Amy Solovay. A headband needs to stretch, so a BLO crochet stitch used vertically is the perfect choice for this type of project. This headband utilizes half double crochet stitch worked through the back loops. If you want to get a feel for the different variations of texture that are possible when working in different loops then this crochet washcloth pattern is a terrific choice. It is a single crochet washcloth with a combination of working in the front loop, back loop and through both loops. V-stitch is a variation on double crochet where you work two double crochet in the same stitch, separate by a space, to create a V-shape. It's a great stitch pattern, and you can change it up to something even more unique by working it in the back loop only. The concept of crocheting in the back loops goes back hundreds of years (or maybe more.) It can be found cited in various vintage crochet manuals, such as The Dictionary of Needlework, 1882, by Sophia Frances Anne Caulfield and Blanche C Saward. This book gives instructions for the stitch by another name; they call it "ribbed stitch" or "Russian stitch." The book also incorporates BLO crochet stitches into various projects such as a "square for a quilt." The authors describe this technique as "working upon the back of the stitches so as to form a ridge." Back loop stitches are also covered in The Harmony Guide to Crochet Stitches by Sylvia Cosh and James Walters. Instructions plus stitch diagrams for back loop single crochet, back loop half double crochet, and other BLO stitches can be found in this stitch dictionary, along with general instructions for completing the stitches.